Nicolas Sarkozy has done it again. In spite of all the warnings and protests from Beijing. His meeting with the Dalai Lama hit Chinese nerves hard. But, the French president probably was betting on the assumption that China and France will have to do business anyway. Indeed, Sarkozy had provoked the Chinese more than once. And, after some slight shows of regret, or perhaps ambiguous explanations, China continued to buy Airbuses. That might exactly be why the French president was bold and assured in the face of Chinese anger, netizens argue. Beijing can expect the same old excuses and vows of loyalty to bilateral ties afterwards. But Sarkozy should not be allowed to have it both ways. He broke this country's clearly defined bottom-line for maintaining friendly state-to-state relations. For whatever the consequences of his stunt will be, the arrogant French president has only himself to blame. Sarkozy upheld his own belief and principle by meeting the Dalai Lama. We Chinese have our own. Sarkozy miscalculated because he underestimated the weight of national sovereignty on the Chinese psyche. He clearly did not know that the government and people of China stand as one on this issue. On this matter at least, the diplomatic representations he received should not have been construed as signals of indignation just from the Chinese government. By the way, an advice for the surprised French - do not mistake spontaneous grassroots expressions of discontent for alleged government instigation. Government preference may determine the purchase of Airbuses, or Boeings. But it cannot force people to travel to places they dislike, be it Paris, or Provence. Nor can it make consumers buy from brand names they feel bad about, be it Louis Vuitton, or Carrefour. When President Sarkozy asked the Chinese to respect his loyalty to his own values and principles, he ignored the Chinese side's special sensitivities on matters of sovereignty. He made reconciliatory gestures after the unpleasant pre-Olympic episodes, and was forgiven by the Chinese. But there is a limit to everything. 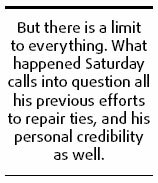 What happened Saturday calls into question all his previous efforts to repair ties, and his personal credibility as well.